Dump the first 12 ingredients in the Instant pot. Set to high pressure for 10 minutes. IP kicks offs automatically to Keep Warm function. After 5 minutes, Naturally release the pressure. Add coconut milk and use a stick blender and blend smooth. Taste and add more seasoning to suit your palette. 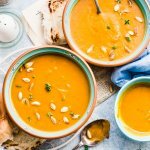 Ladle the soup straight into bowls, garnish with thyme and pumpkin seeds and serve this warming Instant Pot Curried Butternut Squash Soup with toasted bread. Addition of chilli gives the heat to the soup. But if you do not like it spicy, do not add it. Chilli balances the sweetness coming from butternut squash. If you do not have apple juice, add granny smith apples and increase the stock by 1 cup.